This past week, EHC Site Managers Don and Janet Lay returned to their home at Enchanted Hills to resume their role of onsite staff. Enchanted Hills has a long road to rebuilding, but in celebration of this little victory, we bring you one of our favorite stories from the fire, as a tribute. It was nearing midnight on Sunday, October 8. Smoke rolled over the mountain towards Enchanted Hills Camp. Staff stumbled out of their homes and glanced eastward to find the entire range of hills ablaze in the distance from the nearing Nuns fire. Seeing the rising torrent of flames and high winds, the group decided on the spot to evacuate. There were 14 people, three dogs and years of history and personal belongings to bring with them. The group packed everything and everyone into their cars, except for two little creatures who would not fit. The goats. Janet had to think on her feet. She grabbed the hose and left it trickling into the bathtub nearby, thinking that at the very least, the goats would have water until they could escape. They patted the goats on the head, and opened the door to the stables, offering the animals their freedom if they wanted it. They said goodbye to Saint Nicholas and Saint Christopher. Loved by campers, guide dogs and horses alike, “The Baby Saints” were a welcome addition to camp when they joined the EHC family in April 2017. Camp site staff Janet and Donny Lay rescued the two pristinely white baby goats, dubbed Saint Christopher and Saint Nicholas, from the Goat Rescue of Sonoma County. They were the latest in a series of goat herds dating back nearly ten years, who contributed to our fire abatement efforts by keep the grassy fuel load down to keep camp safe and intact. They soon became much more, and our Enchanted Hills Facebook fans and hundreds of campers came to know them as unofficial mascots. The Baby Saints in a bright green field after arriving at EHC. Janet and Saint Christopher on the goats’ first day at EHC. The furry four-month-olds quickly found a routine and became highly socialized, hanging with the horses from the Thacher School in the summer months and learning how to graze. They’d call out to campers walking up the road, begging for some love and attention, or frolic with camp counselor Analisa’s guide dog Walten in the stable while she worked in the pasture with the horses. They came to love people so much that they sometimes needed to be shooed away from trying to enter the dining hall. When the horses left at the end of the summer, the goats were forlorn — but took to their jobs of grazing through the property and clearing away dense brambles and thickets. After evacuating, site staff hoped to return to gather more of their personal belongings, but it was too late. Throughout the week, they watched from temporary lodgings throughout the Bay Area as satellite imagery showed a red patchwork moving closer and closer to camp, so that soon it was right on top of the property. Janet and the team panicked, worried about the loss of their beloved home, but also for the gnawing sensation that there were two living, loving creatures still stuck up on the mountain. On Thursday morning the fires had seemingly slackened and cooled and Janet woke up early, with new resolve. Frustrated by the road closures that blocked any entry for miles around our camp, she jumped online to see if anyone in the Napa area could get into EHC and help the goats. She discovered the Napa Community Animal Response Team (Napa CART) on Facebook and was relieved to discover that they were busy rescuing animals in the Napa area. She immediately started an email conversation that led to a few phone calls. She sent them a map of the property that indicated where the goats were likely to be found. 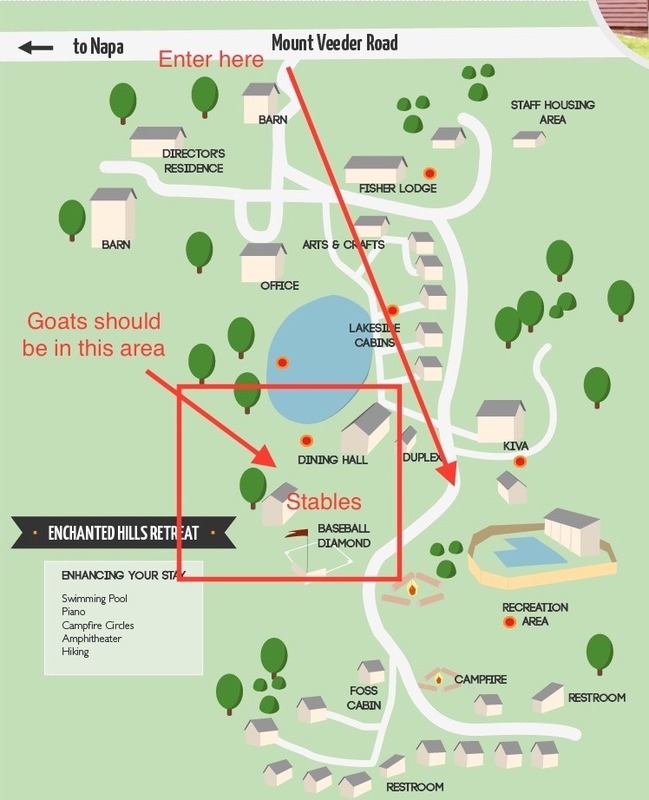 Map of Enchanted Hills Camp with the stable circled in red. The Baby Saints were safe. But where had they been? How had they managed to stay alive as flames tore through camp and across Mount Veeder, destroying dozens of EHC structures and leveling countless houses in the surrounding area? With a little sleuthing, the pieces started coming together. The man on the phone was Sergeant Jeremy, a local Napa Animal Control worker and volunteer with the Napa CART organization. He had set out to EHC with Janet’s map in hand, unsure if the goats would be there when he arrived. But when Sergeant Jeremy got to camp, the Baby Saints were right where Janet thought they’d be: huddled together in the bathtub near the stable, where Janet had left them a vital water source. They came running when called, relieved to find a human companion after days of fending for themselves. The goats huddled together in the bathtub. The telltale evidence of how the goats survived: goat droppings in our dining hall. Despite having been through a lot, the goats were still frisky, Sergeant Jeremy said, recounting how he had to wrestle the little saints into a dog catcher truck, and after a brief tussle, carted them safely away from the property. No rescue mission would be complete without a tussle. The Baby Saints spent the last few weeks on a leisurely staycation at a farm in Napa ever since, and with Janet and Donny back at camp as the site caretakers, the Baby Saints are now back home at EHC. Goats may seem like odd pets to keep, but our appreciation for these little creatures goes much deeper than companionship. Between 2008 and 2013 we brought hundreds of goats to Enchanted Hills as part of an overarching fire abatement plan, to munch and maintain the underbrush and flammable wilderness that surrounds us on all sides. It is thanks to this planning that so many of the central structures in camp are still standing — including the fire-safe dining hall — where the crafty little survivors took refuge during the worst of the fire. In some ways, we owe these humble (and insatiable) creatures a big thank you for the things that survived the fire. May they graze peacefully and heartily for years to come. A giant thank you to Napa CART, Sergeant Jeremy and the handful of EHC friends and staff who helped to complete a successful goat rescue mission. We’re immensely grateful for the safety of our EHC site staff and the furry creatures they cohabitate with. But in order to get them back in business, there’s work to be done. Please help us Rebuild EHC after the devastating fires that led to the destruction of 29 of our structures, including the 10 cabins that have housed hundreds of summer campers and counselors every year since 1950.